@jeepinjeepin Your call. Just make it clear what your intentions are if you stretch it out. Looks like we might have to stretch this one out. I’ll be gone flying over the weekend. We can wait until we get at least 2-3 or I’ll wait for admin advice. Hello @C2theE, Welcome to KiteLife®! Although this is an automated message, it is written with heart - I love kites deeply, and I believe the KiteLife community represents this passion with a very friendly and helpful environment for everyone. Please feel free to browse around and get to know the others. If you have any questions please don't hesitate to ask. Need to tweak settings? Edit your profile here - View Member Edit your settings - http://kitelife.com/forum/settings/ Other than that, here are a few handy links that you might have a use for... Member Chat Member Map KL Shop And while it's never an obligation, we always love hearing about our new members if you'd like to share some of your kite stories, videos, and/or background... Tell us a little about YOUR kite life! Hello @spiff, Welcome to KiteLife®! Although this is an automated message, it is written with heart - I love kites deeply, and I believe the KiteLife community represents this passion with a very friendly and helpful environment for everyone. Please feel free to browse around and get to know the others. If you have any questions please don't hesitate to ask. Need to tweak settings? Edit your profile here - View Member Edit your settings - http://kitelife.com/forum/settings/ Other than that, here are a few handy links that you might have a use for... Member Chat Member Map KL Shop And while it's never an obligation, we always love hearing about our new members if you'd like to share some of your kite stories, videos, and/or background... Tell us a little about YOUR kite life! AHHHHH taking a break and the link isn't coming up. Hope it's not gone for good cause like a fool I didn't download it. Used this more than anything else. Well I guess I'd better put up the Nighthawk cause it's the best when I fly angry. DANG NAB IT!!!!!!!! Wow I was celebrating the holiday and forgot about the rest of you folks.Assumed it was going to be in my kite shed recuperating from the journey tomorrow or Thur. at the latest. I heard JB was at the Ferrari plant trying to trade a set if Djinns and some lessons for a new car. Sheesh some people will do anything to drive one of those beasts.Personally I couldn't afford the gas cause I'm saving for another kite. I am interested in knowing what people are using for line. For example I have a Peter Lynn 12m lifter. Does anyone have the same type lifter and what are you using for line and what tensile strength? I have a 25m Maxi Peter Lynn Octopus. What are you using to fly yours on? I think I have a 10ft rainbow stacker somewhere. Id have to find it and see what condition it's in. I'll look tonight and post some pics. Hello @Stan Palhofski, Welcome to KiteLife®! Although this is an automated message, it is written with heart - I love kites deeply, and I believe the KiteLife community represents this passion with a very friendly and helpful environment for everyone. Please feel free to browse around and get to know the others. If you have any questions please don't hesitate to ask. Need to tweak settings? Edit your profile here - View Member Edit your settings - http://kitelife.com/forum/settings/ Other than that, here are a few handy links that you might have a use for... Member Chat Member Map KL Shop And while it's never an obligation, we always love hearing about our new members if you'd like to share some of your kite stories, videos, and/or background... Tell us a little about YOUR kite life! Hello @David Brittain, Welcome to KiteLife®! Although this is an automated message, it is written with heart - I love kites deeply, and I believe the KiteLife community represents this passion with a very friendly and helpful environment for everyone. Please feel free to browse around and get to know the others. If you have any questions please don't hesitate to ask. Need to tweak settings? Edit your profile here - View Member Edit your settings - http://kitelife.com/forum/settings/ Other than that, here are a few handy links that you might have a use for... Member Chat Member Map KL Shop And while it's never an obligation, we always love hearing about our new members if you'd like to share some of your kite stories, videos, and/or background... Tell us a little about YOUR kite life! 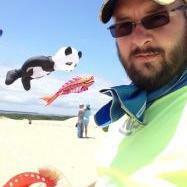 Photos of my home made kites and accessories. Many made from Gomberg Kite tails. I'm looking for an original 10 ft. Flexifoil (Ray Merry type) that has either a STARS and STRIPES, FLAMES, RAINBOW or all BLACK pattern. Maybe interested in a 12ft or 16ft. if you have one. I'm not looking for the newer parafoil kites. Thanks!